One of the highlights of our trip to Belize last week was going out to the barrier reef, the second largest in the world. Getting there required an hour-long boat ride from Placencia, and upon arrival you were treated to a paradise of numerous small islands and atolls. 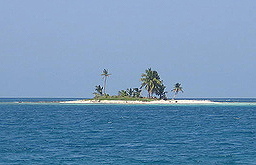 We were dropped off on Queen Caye for a day of relaxing… our own deserted isle. As you can tell from the actual photo, this is a rather small island… it takes about 3 minutes to walk around it, and you’re welcome to sit under any of the approximately six palm trees. A moderate rogue wave would wash right over it. Surrounding the island about fifty feet offshore is its own reef, creating a shallow lagoon and some amazing snorkeling. There was the obvious discussion of what would happen if the boat didn’t return to pick us up. How would we survive? What would be our first survival priority? This got me to thinking about lean manufacturing (yes, how warped is that? ), and how many successful lean transformations are driven by an urgent need for company survival. Many lean activities take a current state and try to remove waste to achieve a more efficient future state. Your kaizen team tries to eliminate all the band-aids and redundancies that have accumulated over time, looks at processes through the eyes of your customer to see what truly adds value, and shortens cycle times and reduces inventories. Along the way you often find you’re measuring things wrong, and perhaps even traditional accounting practices incent poor practices. But you’re still starting from a point of "having a lot"… you’re removing from a state of unnecessary abundance. An abundance of waste, but still an abundance. An organization under the stress of potential business collapse probably looks at it a little differently, but the question is still "what isn’t necessary?" What would happen if you took a different starting point: a blank slate. Nothing. Then add only what is value from the eyes of the customer. Some organizations try this, but it can be daunting. Some of us have also tried it when starting a new company, which is a perfect opportunity. If you’re a brand new company with zero revenue and perhaps living frugally off of angel investment, what is your first priority? I doubt it’s an investment in expensive MRP software. It’s probably not a convoluted NCMR or CAPA process. You create the bare minimum required to deliver a high value product to your first customer. One factoid from a previous career at a Fortune-50 medical device company has stuck in my mind and guided some of my thoughts. The federal medical device regulations (CFR 21) that applied to this multi billion dollar company were about 25 pages in length. The corporation turned that into about 250 pages of guidelines, which each division turned into about 2500 pages of operating procedures, which each plant turned into about 25,000 pages of product manufacturing and inspection instructions and forms. Across 50 plants or so that becomes… well… some wicked large number. I remember asking a plant QA manager if he could map each plant-level page of documentation to the original CFR requirement, and his eyes widened before basically calling me a non-compliant heathen. So perhaps a couple things to think about during your next kaizen. When trying to identify and remove wasteful activities, ask what would be truly necessary if you had a blank slate and zero funds. And ask what truly creates the need or requirement in the first place.